This post is all about Latest Tena Durrani Party Wear collection 2019 for Pakistani formal dress designs which truly has something to satisfy every type of customer from daring to traditional. You can enjoy this collection as a bride or as a guest, she is known for her couture bridal wear and party dresses and work with cotton, jacquard, chiffons, jamavar, kamdani dupatas and silk. 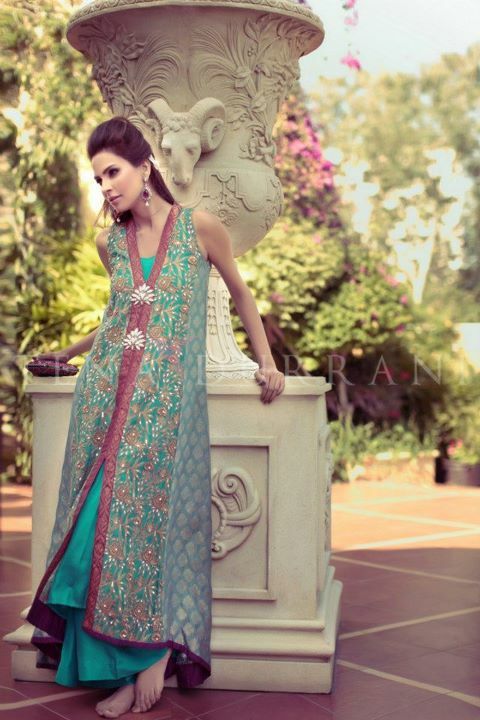 Tena Durrani is catering to the needs for party dress designs of Pakistani women and girl since 2005. You can also check Best Party Wear Frocks collection famous in Pakistan right now. Tena’s new 2019 party wear collection consists of Pakistani dresses with western influence yet with the traditional touch. Check the list of Tena Durrani formal collection 2019 for latest dress designs and styles by Pakistan’s top fashion brand. All dresses are made of fine quality fabrics like chiffon, jamavar, silk with mughal inspired intricate embroidery patterns on neckline and back motifs, sleeves, and hemline that gives her outfits a unique look. She used the deep purple, yellow gold, zinc, turquoise, cream, green and pink with contrast embroidery to balance the colors. Here I have collected some beautiful formal party dress pictures from her new party wear collection I hope you will enjoy this outfits. Let me know about your feedback in the comment section below. Hope that you like this party wear dresses by Tena for this year. Most dresses are sleeveless but sleeves can be attached according to the customer requirement. For purchasing these beautiful formal party wear dresses you can contact her at this mailing address and you may visit her facebook fanpage. Workshop address: Mezzanin floor, plot no 9-c, 2nd Rahat Commercial Lane, off Khayaban e Rahat. or you may visit her website for more details. See these links for latest hairstyle and nail art trends for parties and wedding.